Through the years, our badges have changed based on the times and the cities status. From a township patrolled on horseback to the city of today, see the badges worn by the law officers of Azusa. 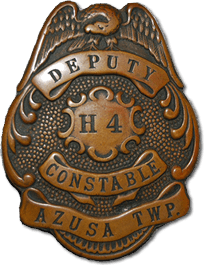 #H 4 is the oldest known Azusa badge. It pre-dates Azusa becoming a city. Azusa became a chartered city in 1898. There is no Hallmark on this badge. We have not been able to authenticate this badge, however we believe it is genuine. 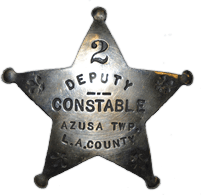 Law enforcement for the residents of Azusa Township was left up to the Los Angeles County Sheriff until the early 1880’s. The problem was that they could not always be counted on since it was a day’s ride on horseback to get from Los Angeles to Azusa. The first known Constable was J.C. Preston who was responsible for basic law enforcement duties. This was an elected, unpaid position, and Constable Preston worked out of his house. He was elected in 1889. This style of badge was common for this time period. We have seen several of these badges with the only difference being the name of the township. The star badge has a Chipron, L.A. hallmark. Chipron made badges from 1892 to 1968. This badge was authenticated by Frank Williams. There are two other silver Constable badges in existence. Both have a single digit number. The elected Constables did appoint other Deputy Constables to assist them. These badges were used during the late 1800’s. The city museum has one of these badges. 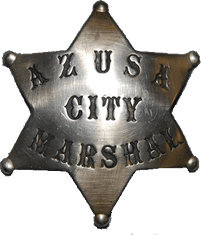 The first known city Marshal appointed in Azusa was Jeff Bryant in the early 1900’s. Marshal Bryant worked with Constable Bill Hamblin who was a Constable from 1895 – 1935. We're not clear why the city would have a Marshal position instead of an additional Constable. We assume that the Constable remained an unpaid position and the growing need for a full time Law Enforcement Officer necessitated the need for a Marshal which was a paid position. This badge was most likely used to instantly deputize someone when the city Marshal needed assistance with a problem in the city. 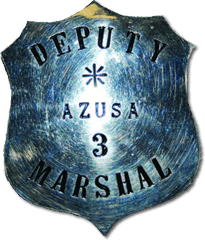 This silver Deputy Marshal Badge #3 has a Chipron, L.A. hallmark. The city museum has the same style badge with a single digit number which authenticates this badge. 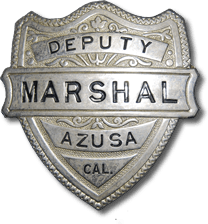 We do not know why there are two different Deputy Marshal badge styles or which one was used first. This badge has a Rubber Stamp Co. Los Angeles hallmark. This is one of several variations of their hallmark. L.A. Rubber Stamp Co. made badges from 1884 to 1935. This badge is a five point silver star with applied ball tips. This badge is believed to be authentic based on the hallmark, pin, and general design. During this time period it was common for cities to have a Marshal who worked during the day and would be called out when the need arose. As the need for law enforcement increased, cities would hire additional Deputy Marshals to assist the Marshal. 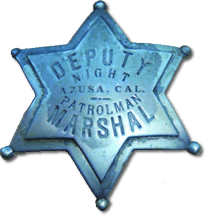 This unique rank of Night Patrolman was most likely the result of local merchants paying for a Deputy Marshal to patrol their businesses during the night.